We’ve been working on a joint project with two other quilters as part of the National Quilt Museum contest, “New Quilts from Old Favorites“. 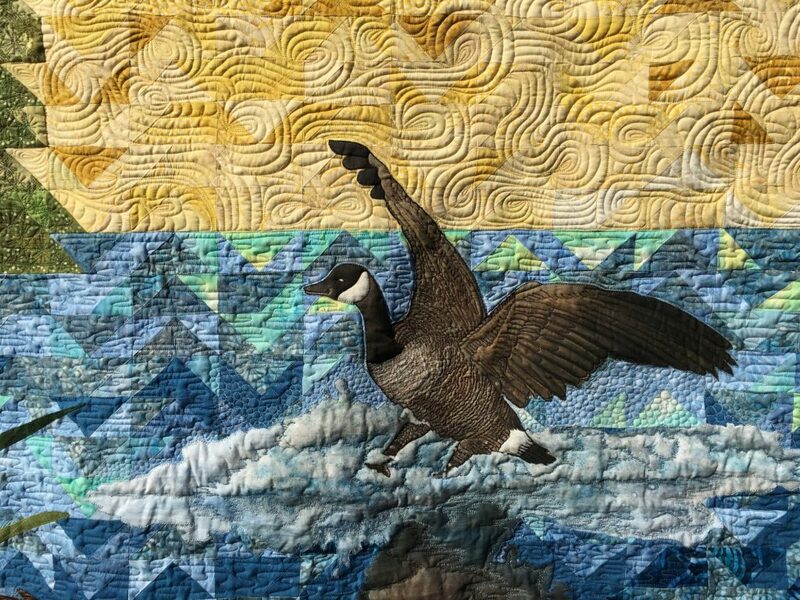 It was a bit of an ouroboros as we designed the recent East Cobb Quilter’s Guild raffle quilt to be inspired by the 2017 “old favorite” block, the flying geese unit. In the process of designing the raffle quilt, we always knew we’d create a second one to specifically be submitted to the museum contest. As such, we present, “Transform”. Listeners to Pam’s podcast Hip to be a Square will remember the project referred to as “The Project That Ate September”. At long last, we can now reveal what that was! The entire background is composed of pieced flying geese units, at around 3,000 pieces. 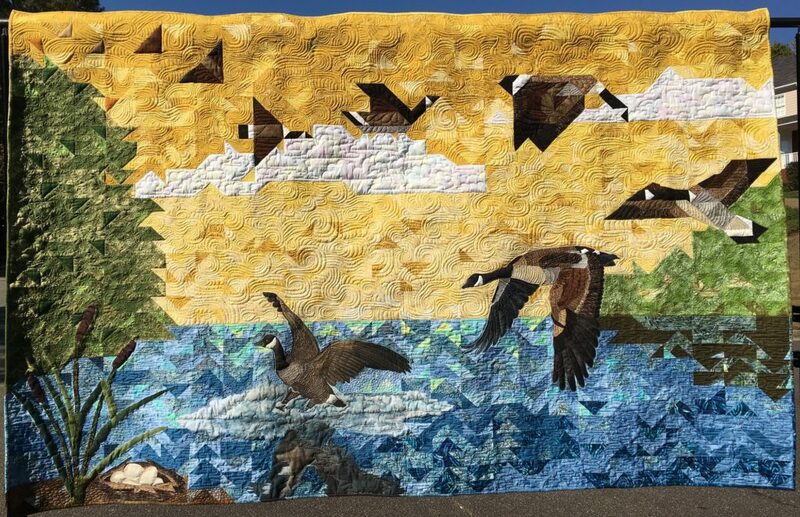 The geese themselves transform from the basic triangle into more complex pieced then appliqued geese, until they reach the hand-drawn goose landing in the water. This quilt was a collaboration between Lynn, Pam, and two other quilters, Devon Pfeiff and Ben Hollingsworth. Pam and Devon pieced the quilt, Ben created the final goose landing in the water, and Lynn appliqued and quilted it. At this time, we’re still waiting to hear if we are a finalist for the “New Quilts from Old Favorites” contest for 2017! Update: Alas, we heard from the committee and our quilt did not qualify as a finalist! Another fantastic quilt from some talented quilters. Thanks for sharing this! Beautiful work ladys. It defiantly should have made it in my oppnion. Ok so I meant beautiful work everyone not just the ladys. Hehe. The quilt is nicely done. You should all be very proud of your submission. Wow, what a great concept and beautiful quilt! Thanks for sharing. Fingers crossed! Wow! Absolutely stunning, I love this! What a beautiful quilt. This is a great collaboration of four very talented artists. Thank you for posting . So sorry to hear it didn’t qualify. It is an amazing quilt…so impressive!! !